by Catherine Haug, February 12, 2012 (All diagrams and sketches by C. Haug, unless otherwise noted). Today, we can just go to a fabric store or online to purchase a pattern for the garment. But what if this was no longer a possibility? Or what if you wanted to make something for which there was no pattern? Or what if commercial patterns just don’t fit your body (this is my problem…)? In times before commercial patterns, people went to their dressmaker/tailor who took measurements and then drafted a pattern according to those measurements. A few days later, you went back to the dressmaker/tailor for a first fitting. If you were a new customer, this fitting was for a special pattern called a sloper, which was then used as a guide to draft patterns for different styles. Today, you can do all of this yourself, without using a commercial pattern at all. The first step is to learn a bit about your body, and how to make garments fit and hang properly on your body. The way to do this is to create a sloper – that special first pattern of days gone by. Your sloper can then be used to help you modify commercial patterns, or to create patterns for your own designs. While Vogue, Butterick & McCalls pattern companies offer basic fitting patterns, as does Burda from Germany, you’ll get a more satisfying result if you make your own. 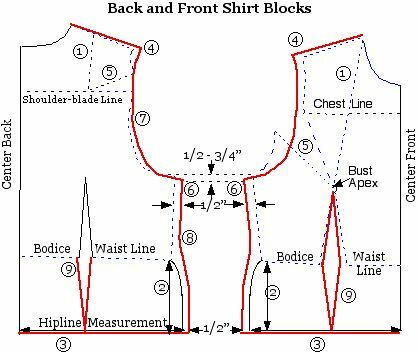 This is a basic fitting pattern that fits your body closely, with very little ease. As such, it is a fabric double of that part of your body to which it is fitted. The sloper is then used to create basic patterns (blocks) from which infinite pattern designs can be created. bodice (or upper torso) sloper, which fits the body from shoulder/neck to waist, and also fits the sleeve from shoulder to wrist. I used flat-pattern method following instructions from BurdaStyle.com: Constructing the basic bodice and Sleeve, but you could use the draping method as illustrated in Threads Magazine, by Kathleen Cheetham (see References, below), if you have a helper. See also Cat’s Bodice & Sleeve Sloper (pdf), for more. 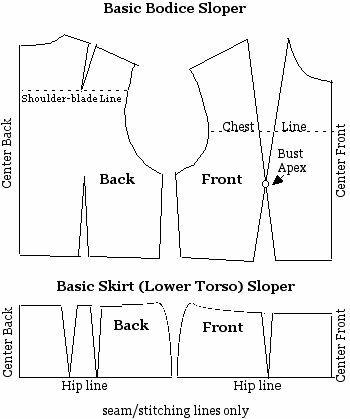 skirt (or lower torso) sloper, which fits the body from waist to hip. I used Drape a Skirt Sloper from Threads Magazine to create my sloper, but you could use flat-pattern method, such as demonstrated by Don McCunn in this video: How to Draft a Lower Torso (aka Skirt) Sloper. flat-pattern, which involves using straight edges, curves, measurements and calculations to draw a draft on paper. The draft is then cut out of muslin fabric so the fit can be refined to the body. The needed changes are then marked on the paper draft. This can be done by one person, though the fitting process works better if there is a second person. Sometimes it takes two or more successive muslins to get the fit just right. draping, which involves working with the muslin fabric draped directly on the body. This has the added advantage of creating the pattern and muslin all in one step. However, it requires at least two people: one to wear the draped fabric, and one to fit the fabric to the body, securing with pins and marking with pen. When completed, all markings are transferred to paper. By whichever method the sloper is made, it only indicates seam lines – no seam or hem allowances are added. These are added only when the sloper is cut out of muslin fabric to be sewn and fitted. See also Prepare your garment or muslin for fitting for info on reference lines, match points and seam allowances. After fitting is complete, the sloper, with all the noted changes, is drawn on tag board or other stiff paper. See Cat’s Bodice & Sleeve Sloper, which shows original draft (from BurdaStyle and Leenas.com), and changes that resulted from muslin fitting. NOTE: none of my sketches include a seam allowance. All lines indicate seam or stitching lines. The terms ‘sloper’ and ‘block’ are often used interchangeably, but there is a difference. The block is drafted from the sloper to add wearing ease, and there are different blocks for different types of garments. Like the sloper, no seam or hem allowances are added, except during fitting with muslin fabric; also, each block is drawn on tag board or other stiff paper. It is worth noting that blocks are useful not only for sewing garments, but also for knitting or crocheting them. Bodice block, made from the bodice sloper. This is used for fitted dress bodices or blouses, with only a little added ease in shoulder, bust and waist. Shirt block, made from the bodice sloper plus hip measurement. This has more added ease than a bodice block for a relaxed fit, and extends past the hips. See my articles Cat’s Shirt Block (pdf) and Drafting a Sleeve Block (pdf; also applies to drafting any sleeve) for details. Skirt block, made from the skirt sloper but with wearing ease and a slight A-line flare. This is used for making skirts or the skirt part of a fitted dress. 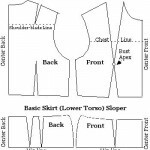 See my article: Draft a skirt block from the skirt sloper. Dress block,made from the shirt and skirt blocks. This is used for dresses with a more relaxed fit, or for those that do not have a waist seam. Jacket block, made from the shirt block. This is used for jackets and vests, and has additional ease to allow the garment to be worn over other garments. It may also have a raised shoulder to allow for shoulder pads. Coat block, made from the jacket block. This is used for coats that require enough ease to be worn over more than one layer of garments, and has raised shoulder to accommodate shoulder pads. Pants block, made from the skirt sloper plus circumference measurements for thighs and calves, and length measurements from the waist: at crotch, knee and ankle. The pants block is used for making trousers, slacks, capris, shorts and jeans. I must add that it can be quite a challenge to create this block and have it fit well. Grading works great for children and young adults who have ‘normal’ body shapes. While the same method is used for adults, the result is not always so good. for one thing, we tend to grow in width while we shrink in height, but grading up increases both width and height – the latter going in the wrong direction. As we age, as gravity and life’s experiences change the shape of our bodies, these commercial blocks/patterns no longer fit well. For example, our shoulders begin to move forward, our backs may round, women’s breasts drop, men develop a stomach pouch, our buttocks drop, our spines may develop curvature causing one shoulder to be higher than the other, or one hip to be higher than the other, and so on. I finally gave up on commercial patterns because they required too much adjustment in a draft muslin for my aging body. It was easier for me to create a sloper and blocks, and then draft my own patterns. This allows me infinite design options. 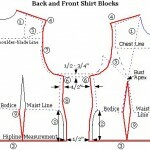 Leenas.com: index for her sloper tutorials: Patterns Drafting Lessons. This entry was posted on Wednesday, February 22nd, 2012 at 1:07 pm and is filed under Sewing & Fiber Arts, Survival; Primitive Living. You can follow any responses to this entry through the RSS 2.0 feed. Both comments and pings are currently closed. Hi, I just want to know where do I get previous Tread magazines qouted in above article? I”m sorry, I mean Threads magazine, published by Taunton Press. See their website threadsmagazine.com for lots of online articles, or their Subscribe page to purchase a subscription. Some fabric and/or hobby stores and book stores sell their magazines. Some past issues can be purchased directly from the magazine (see their Back Issues page); otherwise, try your local library or ask around at better fabric stores – you may find someone who can loan you a particular issue. Hi am drafting a basic block for my father and do not have his pant depth or rise measurement. Is there a standard depth for a 35 inch waist, mens slacks.